We attempt in this study to evaluate the effect of intravenous iron saccharate (i.v. Sach) on the erythropoietin (EPO) requirements during the initial phase of replacement therapy with recombinant human erythropoietin (r-HuEPO) in adult chronic hemodialysis (HD) patients. We evaluated 96 study patients who completed 12 weeks of treatment with EPO. There were 69 (72%) males and 27 (28%) females with a mean age of 44 ± 10 years (range 24 to74 years). The patients were initiated on EPO at 50 units/kg body weight subcutaneously post-dialysis two to three times weekly. 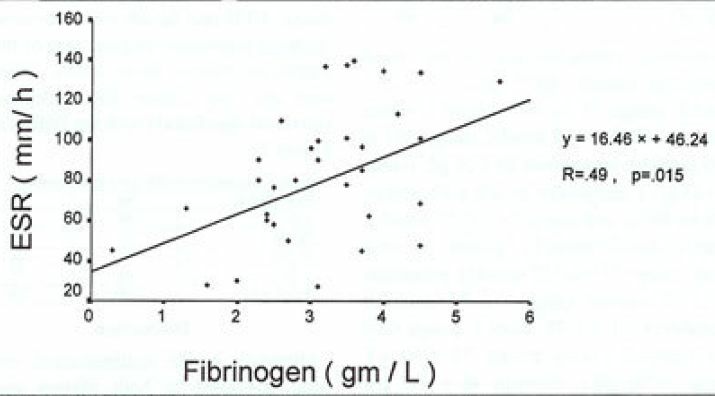 Intravenous iron was administered to maintain the ferritin levels and transferrin saturation ratio within normal range. There were 36 (37.5%) patients who received i.v. Sach at doses of 100 mg at the end of dialysis two or three times per week during the whole study period (total dose 2400-3600 mg). Of the 96 study patients, 91 (94.8%) responded to the EPO. The mean hemoglobin (Hb) at entry to the study was 72 ± 84 g/L (range 52-88 g/L). There was a significant increase of the mean Hb to 108 ± 10 g/L (range 70-120 grams/L) at the end of the study (P<0.0001). The mean total weekly dose per kg per patient per week of EPO was 149 ± 11 (range 100-225) units/kg/week and decreased significantly to 141 ± 24 units/kg/week at the end of the study (P<0.0006). 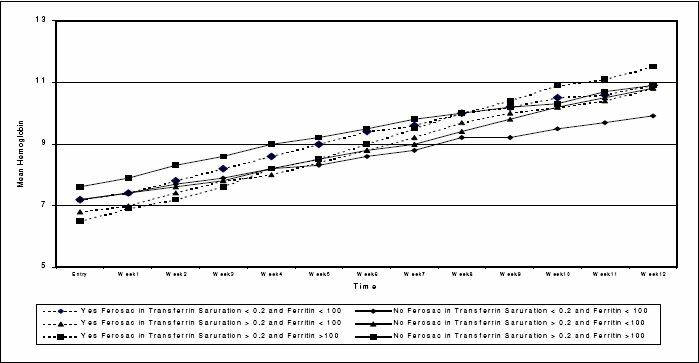 The study patients were stratified by the baseline ferritin and transferrin saturation (TSAT) into three sub-groups: group I: patients with TSAT <0.2 and ferritin <100 ng/ml; group II: patients with TSAT >0.2 and ferritin <100 ng/ml; group III: patients with TSAT >0.2 and ferritin >100 ng/ml. There were 19 patients in group I (13 received i.v. Sach), 26 in group II (16 received i.v. Sach) and 44 in group III (seven received i.v. Sach). There was a group of seven patients who had TSAT <0.2 and ferritin >100 ng/ml, however, none received i.v. Sach and they were not included in the stratification. There was no significant difference in the mean Hb between patients who received and those who did not receive i.v. Sach in the sub-groups studied. However, there was a significant decrease in the mean weekly dose of EPO in the patients who received i.v. Sach. We conclude that routine use of i.v. iron supplementation in chronic HD patients receiving recombinant EPO may be beneficial in the initial phase of treatment in attaining the target Hb with lower doses of EPO, regardless of the status of the iron indices. Although unfractionated heparin (UFH) is the anticoagulant commonly used for hemodialysis (HD), low molecular weight heparin (LMWH) has been found to be equally efficacious. The aim of this study was to explore the safety and efficacy of a single bolus dose of the LMWH, enoxaparin. Thirty-eight patients on maintenance HD were randomly divided into two equal groups. The mean age and body-weight of the two groups were comparable. While one group received 1 mg/kg body-weight (the manufacturer's recommended dose) of enoxaparin for three dialysis sessions of three-hours duration each, the other group received a fixed dose of 40 mg for the same number of dialyses. For the next three dialysis sessions, these doses were exchanged between the groups. In all, a total of 228 HD sessions were monitored for clotting of blood lines/dialyzers and bleeding from vascular access and other sites. The rate of complications was compared with the historical data while UFH was being used for the same patients. In general, enoxaparin was associated with fewer episodes of bleeding and clotting. Our study confirms that LMWH is of comparable efficacy to UFH and probably a lesser than recommended dose is adequate for a three-hour HD session. Enuresis is a common symptom that leads to significant psychosocial sequalae. In this study we analyzed three surveys in three different urban and suburban regions in Morocco in order to evaluate the epidemiological characteristics and profiles of the young patients who had enuresis and the attitudes of their parents towards this problem. There were 1,520 children and adolescents in this analysis whose age ranged between 5 and 15 years. They were attending various outpatient surgical and medical clinics when their parents were asked to answer a pre-prepared questionnaire. The prevalence of enuresis was 35% with preponderance of males (54%). The cause could not be defined (primary) in 91.5% of the patients with enuresis. There were familial factors associated with enuresis that included history of enuresis in the parents or siblings in 56% of the cases and coercion attitude of the parents in 23%. Enuresis was associated with impediment of learning in 23% and chastisement of children in 85.4% of the cases. Twenty three percent of the patients also had chronic organic disorders. The parents were concerned mostly when the children approached puberty or when enuresis was secondary to another problem. Spontaneous improvement was the rule by adolescence, hence only 8.7% sought medical advice for enuresis. Treatment was conventional in 67% of the cases and confined to restriction of fluids and food items in 73% of the treated patients. We conclude that enuresis is apparently higher in Moroccan children compared to reports from other countries. However, enuresis was not considered a major medical problem of concern to parents who rarely sought medical advice for it. We describe four patients with chronic renal failure (CRF) who developed significant neurotoxicity after receiving short-term ciprofloxacin. Three of them had developed encephalopathy with myoclonic jerks and one patient had delirium. All patients had advanced chronic renal failure (mean estimated creatinine clearance 16 ± 6 ml/minute), although they were not yet on renal replacement therapy. The mean received dose of ciprofloxacin was 2150 ± 1300 mg and symptoms started to appear after the first 24 hours of drug intake. Investigations ruled out other possible causes of these neurological presentations, and withdrawal of ciprofloxacin was followed by complete resolution, after a mean of 8.5 ± 4 days. Advanced renal failure in all patients and underlying neurologic diseases in two patients may have predisposed them to the neurotoxicity. The report of these cases should help to draw the attention of clinicians to the potential occurrence of these adverse effects in patients with CRF. Cystinuria is a rare autosomal recessive trait with a defect in transport of cystine and other dibasic amino acids in the kidney and intestine. Renal stone formation is the only clinical presentation of cystinuria. We present herewith three cases with cystinuria. Case 1 is a 13-year-old boy known to have Bernard Soulier syndrome who presented at the age of six years with staghorn stone of the left kidney. He was treated with extracorporeal shock wave lithotripsy (ESWL) with little benefit, followed by percutaneous nephro­lithotomy (PCNL). He still gets recurrent renal stones and is being treated with high fluid intake, low sodium diet, captopril, K-citrate and D-pencillamine. Case 2 is a 10-year-old boy, brother of the first patient, who was diagnosed as cystinuria on family screening. He presented with bilateral tiny renal stones. Case 3 is a four-year-old girl who presented at the age of 1.5 years with urinary tract infection (UTI). Renal ultrasound showed left hydronephrosis and intravenous pyelography (IVP) showed bilateral ureteral stones. She underwent cystoscopy and lithiotripsy twice; currently she is on captopril, K-citrate, high fluid intake and low sodium diet. We believe this is the first report of cystinuria in children from Bahrain. Aortic dissection may be associated with renal disease. The presentation, especially in the later stages of the process, includes proteinuria, hematuria and impairment of renal function. Thus the clinical picture may be confused with glomerulonephritis or hypertension. We present a case of ischemic nephropathy resulting from involvement of the right kidney by an aortic dissection. 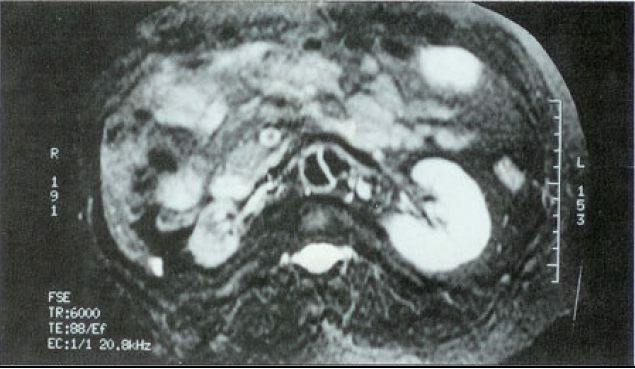 The pateint presented with the nephrotic syndrome some two and a half months after the probable time when the aortic disection had occurred. At that time the initial back and flank pains had disappeared. 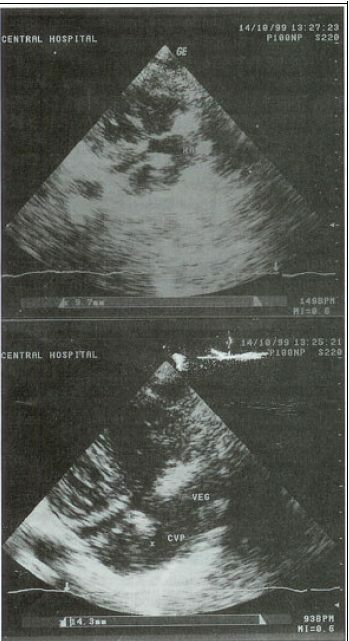 Ultrasound examination revealed a smaller right kidney, compared to the left one. Imaging techneques, initaited for suspected renal artery stenosis, revealed aortic dissection involving the right renal artery starting from the descending aorta, distal to the origin of the left subclavian artery and extending down to the right common iliac artery; occluding the right renal artery. The medical literature is reviewed for patients presenting with ischemic nephropathy and the mechanisms of proteinuria discussed. We conclude that ischemic nephropathy can clinically mimic glomerulonephritis and can be missed if it is not included in the differential diagnosis of patients who present with heavy proteinuria and hypertension. There is an increased risk of infective endocarditis catheterization used for hemodialysis. We report a case of a young man who had endocarditis secondary to the use of a permanent jugular catheter for hemodialysis. Blood cultures were repeatedly negative, but vegetations were seen on the tricuspid valve on echocardiography. A high index of suspicion is recommended for this serious complication. To determine the patterns of infectious complications in the renal transplant recipients in our center, we evaluated 18 patients (13 males and five females) who were transplanted between 1994-1998. The average age of the patients was 28 years. Sixteen (88%) and 2 (12%) transplants were from living-related and cadaver donors, respectively. 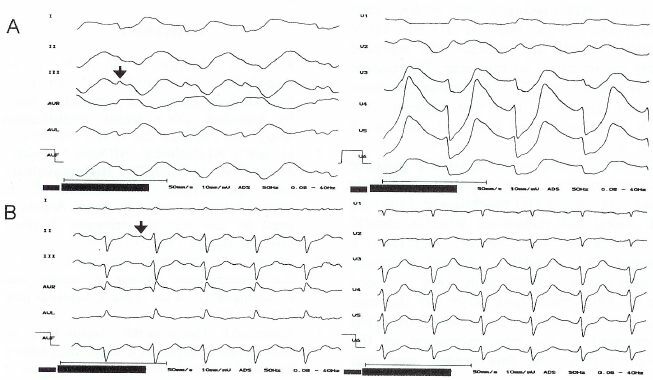 Posttransplant immunosuppression consisted of azathioprine, prednisone, antithymocyte globulin (ATG) and cyclosporine.The acute rejection episodes were treated with pulse doses of methylprednisolone; steroid resistant rejection was treated with ATG or muromonab (OKT3). All patients received prophylaxis with sulfadoxin-pyrimethamine; none received prophylaxis against cytomegalovirus (CMV) infection. Thirteen (72%) recipients developed 44 confirmed episodes of infection; 19 (43%) episodes occurred in the early postoperative period, 16 (36%) in the first month and nine (20%) after six months. According to the type of infection, there were 12 urinary tract, 12 CMV, four herpal, five general septic, three fungal, two pneumonia, one disseminated nocardial and five miscellaneous episodes. All six (100%) patients who had acute rejection episodes developed infection compared with 7/12 (58%) who did not have rejection (p < 0.01). There was a significant correlation between CMV disease and acute rejection. CMV infection occurred after the additional immunosuppressive treatment for acute rejection in 6/6 (100%) patients. We conclude that CMV infection was the most frequent opportunistic pathogen in our renal transplant population and related to the intensive antirejection therapy, followed by urinary tract infection, which occurred within three months after surgery. The aim of this study was to know the characteristics and risk factors of 13 diabetic patients (8 males and 5 females) undergoing chronic hemodialysis (HD) at the King Abdulaziz University Hospital in Jeddah during the last one and half years. The 13 diabetic patients who were included in the study constituted 31% of the total patients on HD. The median age was 50.7 year (33-60 years) with M: F ratio of 1.6:1, and Saudi to non-Saudi ratio of 1:1.8. The mean duration of diabetes mellitus (DM) was 12.15 year (3­28 years). Almost half of these patients required HD within 10 years of diagnosis of diabetes. The mean age at starting HD was 46.9 year (33-59). All patients were hypertensive, and 46% were hyperlipidemic. History of smoking was present in 38.5% (5 patients, all men). Complications of diabetes were documented in almost all patients, proliferative retinopathy in 53.8%, bilateral cataract in 15.4%, while one patient had total blindness. There was clinical evidence of peripheral neuropathy and ischaemic heart disease in 30.4% of patients, whereas stroke and gangrenous foot were each seen in 7.7% of patients. Our brief report confirms that DM contributes significantly to end stage renal disease. This could be attributed to poor glycemic control, inadequate treatment of hypertension, high smoking rate and inadequate screening for micro-albuminuria.